Everywhere we look in nature there is collaboration. For example, ants and bees work together for the benefit of their colonies and hives. The natural world is filled with such instances of cooperation for the benefit of all, and Friends of the Fairfax County Park Authority are following nature’s lead. They’re uniting for common causes. Nearly two dozen Fairfax County Park Authority sites have Friends groups that support individual parks through fundraising, volunteer service and other actions. 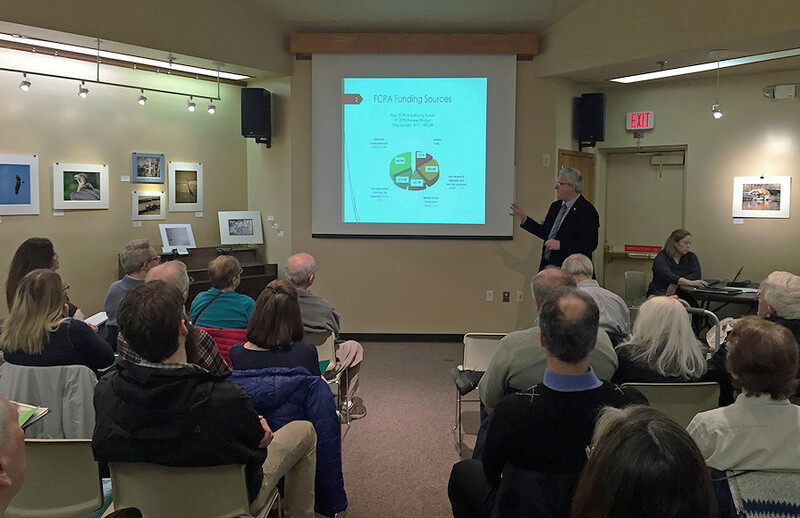 Those individual groups are looking for ways to work together, and on February 27, 2016, representatives of the Federation of Friends held a joint meeting with leaders of the Park Authority and the Fairfax County Park Foundation at Huntley Meadows Park to learn what they can accomplish through shared goals. At the meeting, the Federation of Friends members were presented with information about the parks they support. 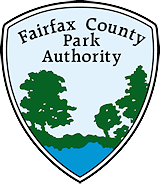 They learned more than 17 million people visit the park system annually, and the Park Authority’s recent Needs Assessment Survey shows that more than 90% of Fairfax County residents think parks are extremely or very important to their quality of life. Attendees also heard from Park Authority Director Kirk Kincannon about the county’s proposed Fiscal Year 2017 budget. After these presentations, each Friends group took a few minutes to talk about its own activities and their shared passion for parks. 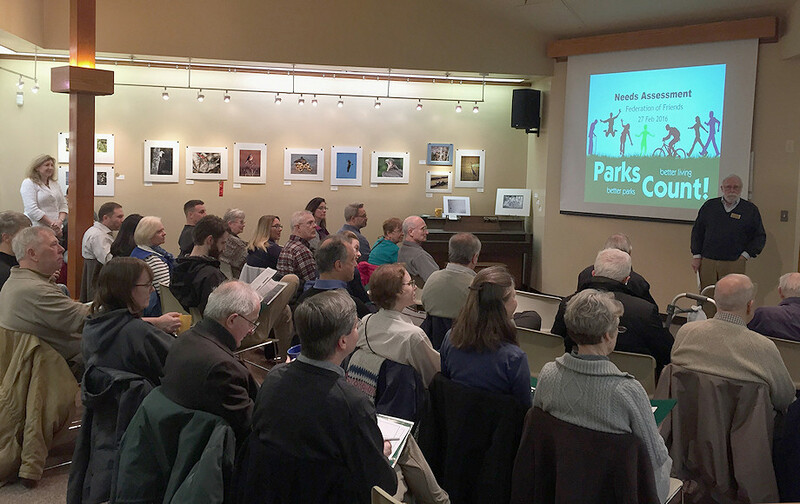 Glasgow noted, “The meeting’s goal was to get Friends to speak for the entire park budget and the well-being of all parks.” That collective approach will help each group’s individual causes. Cathy Ledec, the president of the Friends of Huntley Meadows Park, which hosted the gathering, said, “There is always such great enthusiasm in the room, and each Friends group is so different in its goals and objectives. I enjoy interacting and learning from our shared experiences.” The hope is that those shared experiences and shared values lead to effective advocacy and continued success systemwide. Director Kincannon explained the distinction between education and information passage and advocacy, noting that county staff is prohibited from lobbying for the Park Bond, advocating for the budget or fundraising. He also explained that it was entirely appropriate for the Friends groups and members of the Park Authority Board to advocate on behalf of the Park Authority. In fact, Friends groups and other park stakeholders can become a voice of advocacy for parks. The Friends groups are organized by citizens who want to help parks, and those groups can raise funds that they may donate through the Park Foundation for projects in parks, such as the RecPAC summer camps, Arts in the Parks, stewardship education for school children, Take 12 Steps for Health, Chessie’s Big Backyard at Lee District RECenter, Pirate Fest and many others. Information about the Federation of Friends and park advocacy is on the Park Foundation’s website. This entry was posted in Uncategorized on March 3, 2016 by Fairfax County Park Authority.